Let’s get back to the fast food analogy. Fast food is carefully designed to maximise sales volume. It provides a predictable product so you know what you are getting with no surprises. The packaging is very important because it needs to look attractive and be convenient to supply and consume. Fast food does need to comply with national food safety and nutrition standards however compliance is frequently to the minimum level and rides a fine line between actually being classified as food. Fast food is also accompanied by a slick marketing campaign where the object is clearly profit. Fast food is quick, easy, to a point it satisfies and it has some nutritional value so it is not all bad. In contrast, the home cooked meal with family around is a completely different experience. The shared experience of cooking together after gathering ingredients, debating recipes, building the process together then sitting down to enjoy the fruits of labour is in a totally different world of experience than that of eating fast food. The joy of reading and sharing literature is replaced by prefabricated mass-produced skills-based exercises. It has the appearance of being “personalised” but this is as shallow as the packaging it comes in (see Alfie Kohn). The experience for our students is so different that it can hardly be considered reading at all. 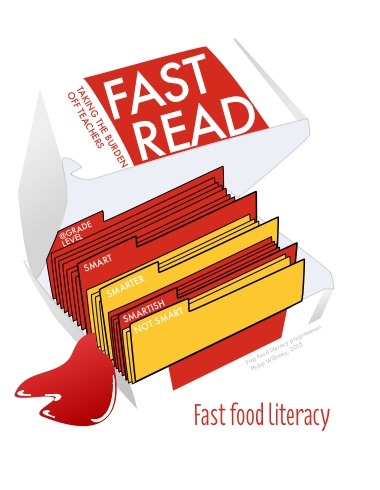 What’s wrong with these fast food literacy programs? 1. They are not student centred. The primary focus is profit, based on making the teacher’s job easier not improving learning outcomes (despite the marketing rhetoric). If schools choose to use fast food curricula then at least spend some time researching the vested interests that drive these programs. Here is one example. 2. It places the control of reading in the hands of corporations and teachers rather than in the inquiring minds of children. 3. Literacy cannot be learnt in a factory assembly line. What is learnt through such programs is not literacy. It is a disconnected, meaningless abstraction. Progress along the assembly line can be measured but has little relevance to language and literacy. Fast-food satisfies the feeling of hunger but what is the real value? 4. These programs remove and isolate students from the real learning context where as agents of their own learning they are able to construct meaning. 5. It is not student led. When students are at the centre of teaching and learning, they choose books for themselves based on their own interests, their own knowledge and their own aspirations – an entirely different brain activity to that of moving one step along a reading program conveyer belt. 6. These programs provide pseudo-data. There are numbers, hours spent, levels achieved, awards but no measure of the things that matter in student learning. Things like understanding, meaning, the birth of a life-long passion, a sense of discovery, creativity or collaborative literacy – the very things that build life long learners. 7. Who has completed the research on these tools and written the reviews? It is almost always those with vested interests – the companies themselves. Researching the impact of quality literature is never discussed in these studies or even used as a control so methodologies are skewed toward marketing not academic rigour. In the same way that fast food is not entirely bad, these programs can be shown to achieve certain outcomes. But where are the comparative studies that compare these programs to regular library visits, having a book read by a nurturing caregiver, sharing a magical story with a friend, holding an idea in your hand and carrying it around in your backpack. The book as a physical artefact is fundamentally a totally different experience. The difference between a stunning vista and a corporate logo. You may have wondered why I have not specifically named any of the reading programs in this post. The reason is simple and closely tied to the reality of these corporate programs. They are big business and being sued for defamation is not in my budget. Suffice to say a quick search online using “levelled reader” or “reading programs” seems to bring up the big hitters in the field so I will leave that up to you. This is from Kath Murdoch’s blog, Just Wondering. Learning to read is a complex, multifaceted process that is non-linear. Reading programs are recipes that look attractive but squeeze student learning into an unyielding straight jacket that is about control and compliance. Reading quality texts in the inquiry context is by contrast, broad, releasing, inspiring, open-ended and a little messy but entirely necessary. Debbie Miller’s book, Reading with Meaning, offers a far more rigorous approach to teaching comprehension that is both explicit and outcome focussed. The aim is to build students who become thoughtful, independent and strategic readers. So let’s relinquish control and let these resources made for teachers go. Let’s focus on literature written by real authors, illustrated by real artists, shared by real people, accessed as real experiences of story, and appreciated for a lifetime. We can all reminisce fondly about our childhood favourite picture books or excitedly share our current reading but would we do that with an A-Z reader?